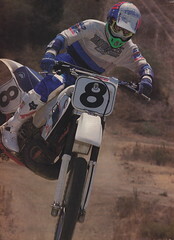 Here is another one of my classic motocross brochures. This one covers the 1981 Honda motocross lineup. The 1981 season was a big one for Big Red, with the introduction of their first Open class bike, the infamous CR450R and the first implementation of their first single-shock suspension system, the Pro-Link. You also have the first implementation of liquid-cooling on their motocross like on the new CR125R and CR250R. This brochure is from the UK and interestingly does not include the hideous “hangnail” front number plates that we got in the USA. Lord knows why someone in the US thought the snow shovel plate was a good idea, but there can be little doubt that the UK version looks one hell of a lot less goofy. I do love those red motors though and these CRs still look pretty damn cool. Enjoy and don’t forget to #RideRed.